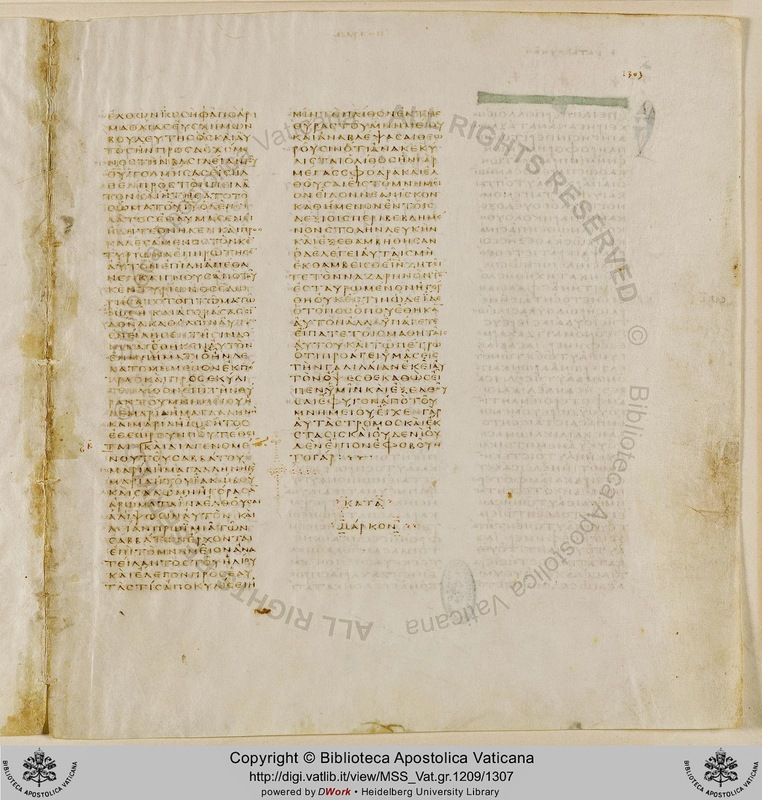 the very leaves which omit the verses were removed and replaced while the manuscript was still in the scriptorium. It is strange to me that so many modern rationalists in the past were able to fundamentally change the New Testament Scriptures. They did this over a whim, and have caused so much confusion and debate throughout the years that is still plaguing the Church. (1) 304 probably did *not* end the text of Mark at 16:8 when it was in pristine condition. 304's text is essentially Byzantine, it is a commentary-manuscript, and there's no subscription after 16:8. Probably we are looking at the first volume of what was once a bulky manuscript that was rebound to make it less unwieldy. Thanks for these insights. I had not heard this about 304 in particular. Hard to believe that the traditional ending of Mark has been abandoned based on such slight evidence. 1. Do you have a scholarly source for an analysis of 304? 2. What is your opinion on why the third column is blank in B? 3. Also, what do you make of the fact that there are artistic flourishes at the ending of Matthew and John (but not Luke--perhaps due to the fact that it ends at the bottom of a column and there is no space) but no such flourishes at the ending of Mark? Are the flourishes at the end of Matthew and John contemporaneous with the text? Would the lack of this at the ending of Mark (with plenty of blank space-unlike Luke's ending) also be an argument for the original intent being not to end the text at 16:8? Maurice Robinson offered an opinion based on a brief viewing of microfilm. But now the MS' microfilm images are online and can be studied in more detail. It's technically not a continuous-text manuscript; it's a commentary-manuscript with the text included. 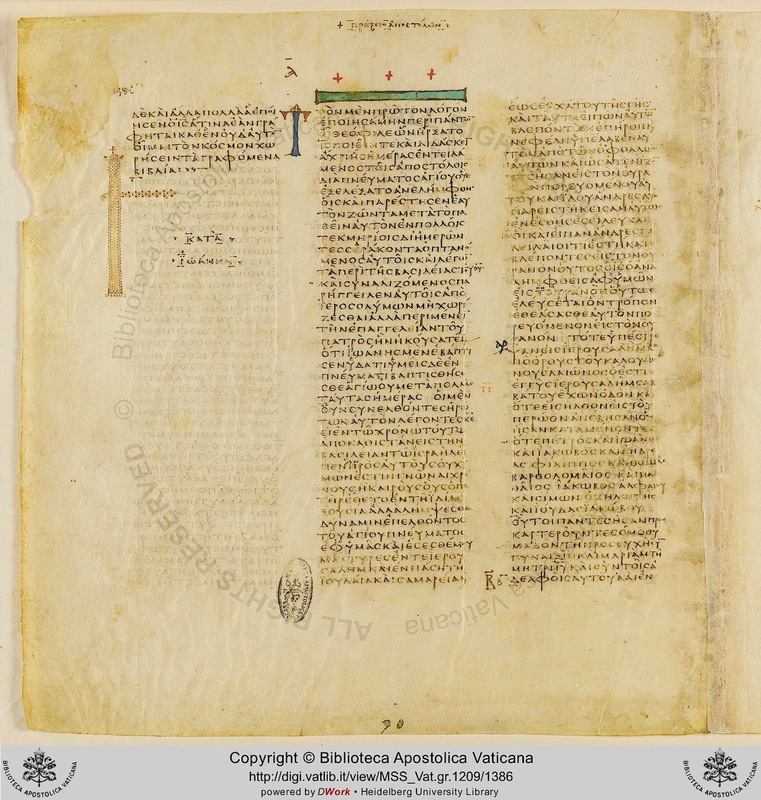 Because verses 9-20 was not in the copyist's exemplar, but he recollected the verses from another MS he had encountered, and attempted to leave space for the absent verses in case the eventual owner of the codex wanted them to be included. In Vaticanus, I don't think the flourishes (or arabesques) have any particular significance, although I have not looked into this in detail. In Sinaiticus, the arabesque/decorative line after Mk. 16:8 is particularly emphatic, compared with the scribe's other decorative lines. 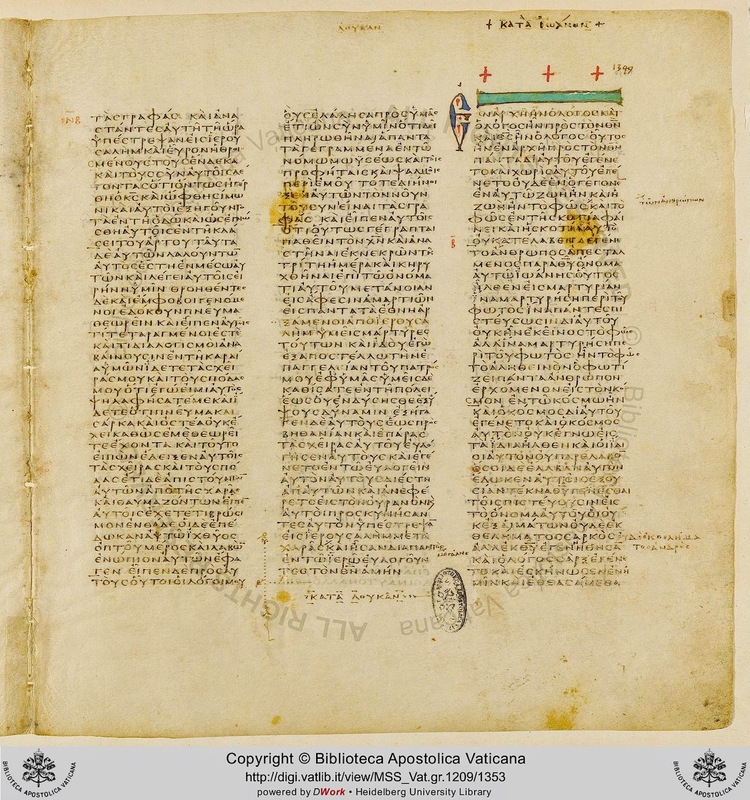 See http://www.thetextofthegospels.com/2015/09/codex-sinaiticus-and-ending-of-mark.html for additional details. Just chiming in to share an update. Digital images of 304 have become available online. And, as it turns out, 304 is not even a continuous-text copy of the Gospel of Mark. 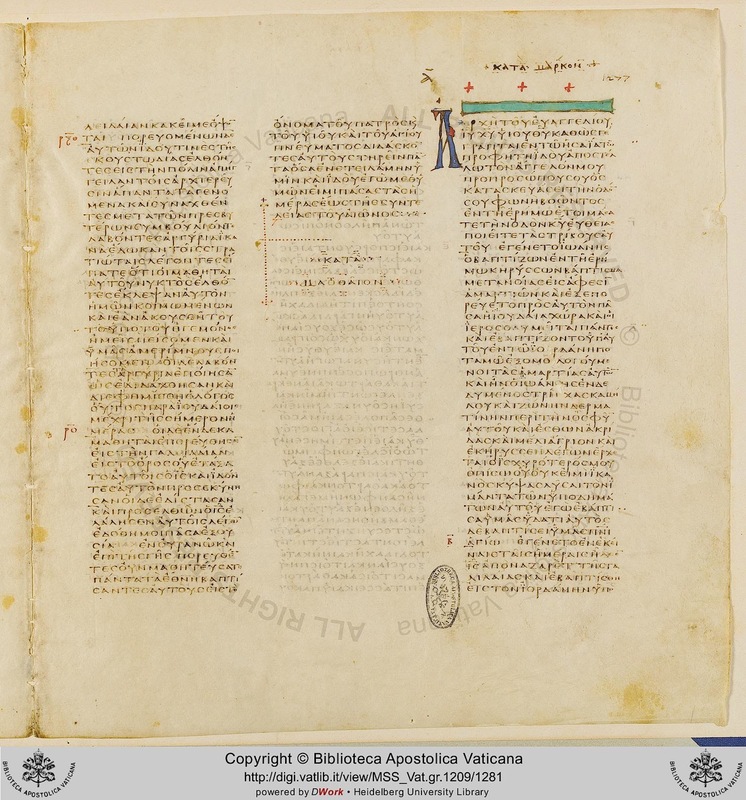 It's a copy of a commentary, and the portion about Mark is based on the commentary of Theophylact, with the text of Mark interspersed between segments of the commentary-portions. Basically: 304's text of Mark ends at Mark 16:8, but the commentary-portion similarly seems incomplete, and, the commentary-portion is very, very similar to the commentary of Theophylact's comments, which, in other copies of Theophylact's Commentary, includes comments on verses 9-20. It rather looks like 304 was copied from a damaged exemplar, and that's that.